Despite a change in publishers and opposition from South Park Studios, Ubisoft's upcoming South Park RPG won't face more delays. Ever since its announcement in late 2011, South Park fans have been looking forward to seeing their favorite foul-mouthed elementary schoolers in the Obsidian Entertainment-developed RPG South Park: The Stick of Truth. The game was one of many properties left up for grabs when THQ went defunct earlier this year, and Ubisoft scooped it up for a mere $3.2 million dollars. After Ubisoft's purchase was met with a court objection from South Park Studios, there was little news about The Stick of Truth. There's no need to worry, though; Ubisoft has confirmed that Obsidian's South Park RPG is still due out in 2013. If everything had gone according to plan (and THQ hadn't needed to file for bankruptcy), The Stick of Truth would have been released earlier this year. 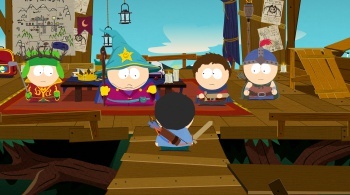 THQ delayed South Park (and a handful of other titles) in late 2012, pushing The Stick of Truth to "early fiscal 2014." Ubisoft hasn't announced a new release date since acquiring the game, making today's news the first indication that it's still on track to come out within the next few months. The questionable release of South Park: The Stick of Truth is a sad reminder of THQ's fate, but the silver lining is that the RPG found a new home at Ubisoft instead of being canceled outright. Those of us who have been waiting patiently now have another big game to look forward to in 2013; all we can do is hope that the bumpy road to completion isn't reflected in the final product.